You are currently browsing the Fat Cyclist weblog archives for February, 2009. If you’re going to be an endurance cyclist — and I assume you are, because it’s a rapidly growing sport with mass appeal and huge sponsorship opportunities — you’re going to spend a bunch of time on your bike, both before and during races. During some of that time, you’re going to be caught up in the moment of cycling — you’ll be concentrating on going your fastest, adjusting to terrain, maybe even talking with other cyclists. But some of the time, I’m going in a straight line at a steady speed, and your brain is going to need something to do. Here are a few things I do. Dividing number of inches in a race by the number of inches in a crank turn: 6,589,440 / 97 = ~67,932 crank turns per Leadville race. ‘Course, I just did all that with a calculator, so it was easy. Doing that in my head while I’m breathing hard is tough. I do a lot of rounding, and I’m never sure whether I get it right. In fact, I don’t think I’ve ever thought to double check whether the result I came up with is close to right. But you have to admit, it’s a pretty big number. Forecast my finish time, based on how I’m doing. This number goes from wildly optimistic to wildly pessimistic as a function of how my legs feel at the moment. Write the race story: I’ll sometimes start writing key segments to a race recap while I’m still in the race. I’m pretty good at this; I can see whole sentences in my head, edit them, and bring them back later pretty much intact. Concoct excuses: When I’m not doing well in the race, I start investigating the past to find a real reason why I did poorly, or at least one that cannot be easily refuted. Then I test out the excuse in internal conversations, honing it to perfection. If it’s really good, it might even become the centerpiece of the story recap. See if I can get a song stuck in my head: Everyone’s got songs stuck in their heads from time to time, but has anyone ever successfully done this on purpose? I’ve tried, and so far I never have been able to. See if I can get a song unstuck from my head: I remember, during the Laramie Range Enduro (100K MTB race, now defunct, alas), I had They Might Be Giants’ “Birdhouse in Your Soul” go through my mind for the entire race. The problem was, I only knew the chorus, and didn’t even have that down cold. By the end of the race, I hated that song desperately, and yet it played on and on and on in my head. Some may ask, “Well, how about listen to music while you’re racing?” Sorry, but I don’t do that. Why not? I don’t want to. I’m fat because of weekends. Peanut butter and mozzerrella cheeze on a tortilla, heated in microwave for 25 seconds. Actually, very tasty. Cool whip and chocolate milk mix (powdered), blended together and used as a dip with graham crackers. Again, very tasty. Saltine crackers with Chipotle-flavored Tabasco sauce (my new favorite hot sauce, by the way). Once again, very tasty, but probably would have been better if I had mixed the Tabasco with sour cream. This ability to always find something to eat — and then eat it, natch — is pretty easy to suppress for short periods of time — a couple of hours, for instance. When I’m at home for 60 hours at a stretch, though, eventually my willpower breaks down. Which explains why my weight has gone from 181.4 on Sunday to 184.4 today. Around 7PM last night, I just started eating, and eating, and eating. Handfuls of Cap’n Crunch, improvisational burritos (everything’s better with a tortilla around it), a bowl of Frosted Mini-Wheats (I could happily eat nothing but cold cereal and Mexican food for the rest of my days), and part of an ice cream cone one of my twins didn’t finish. I was, in short, a train wreck. Originally, I intended to spend some time today detailing the weirdness I’ve been through in the past year, and try to link it to my current weight problem. I think this is the more honest answer, though: I’m fat because I run out of willpower before I run out of weekend. Mark my words, you’ll see a variation of that on a fridge magnet someday. Everyone who reads, comments, and emails me about this blog has been remarkably cool about the fact that sometimes I use it to talk to myself about what’s going on in my life. That said, I try pretty hard to keep from talking too often about how I’m doing, because the fact is I’m usually doing pretty bad these days, and if that’s what I talked about all the time, this wouldn’t be a very fun blog to read. And I want it to be fun. Anyway, a while back I discovered that if I have a little focus and discipline, I can write something funny even when I’m not feeling very funny at all. But I’m also discovering that it takes quite a bit out of me. I look at stuff I used to write before Susan’s cancer metastasized and I remember how easy it was to write funny posts back then. It’s not like that now, though. So, sometime yesterday afternoon, I decided I need to take a break. For the next ten days, I’m going to move over posts from my old Spaces blog — something I’ve wanted to do anyway. So there’ll still be a “new” post here every day. And — to get back to my original blog focus — I’ll be posting my current weight (184.0 today, by the way, so the Jell-O diet evidently rocks). While I’m gone, I’ll be working on stuff that’s still blog-related; I have a couple ideas I’ve wanted to pursue but haven’t had energy for. And when I come back March 10, I’m planning to have the energy to write the kind of posts I like writing. The lie in that assertion is right there in the image: If you’re not planning to eat a whole bunch of Jell-O, why do you have so much Jell-O? Jell-O is gross. I concede this point. The “jell” in Jell-O comes from, as near as I can tell, from pig hooves, cattle tendons, rat claws, and ground-up snail shells. I have known this all my my life. It doesn’t bother me. I’m a product of my environment, I suppose. 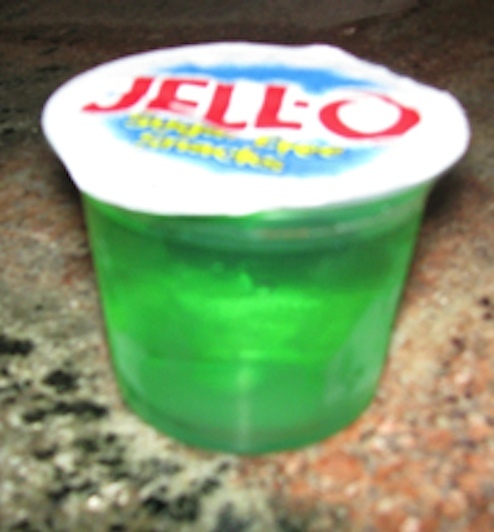 Sugar-Free Jell-O is poisonous. It’s got aspartame, which is bad. I concede the probability of this, but the truth is, as a consumer of vast quantities of Diet Coke every single day, any harm I incur from a day of gorging on Sugar-Free Jell-O is going to be incremental. Besides, I like to live dangerously. This diet is not sustainable. That’s true. I will do this for one day, and one day only. The packaging is wasteful. Yes, it is. And ordinarily I would have just bought the powder and mixed this up myself. But I really, really wanted to make a Jell-O cup pyramid. A photo of a big bowl full of Jell-O just wouldn’t have been dramatic enough for me. You’ll shoot your eye out, kid. OK, nobody actually said that, but I think it’s always a valid concern. The question you should be asking yourself about this day of Sugar-Free Jell-O consumption is: “Why?” Why would I do such a thing? I have many reasons, each better than the previous, but not quite as good as the next. The blog must be fed. It’s been months since I’ve been out on a biking adventure. All of my riding currently happens early in the morning, in the spare bedroom, on rollers. Which is not exactly the best source of new material that has ever existed. So yes, I’m stretching here. Demand a refund if you feel you’re entitled to one. I need to draw a line in the sand. I don’t want to go into serious stuff today, but the truth is that with my life the way it is right now, I’m having a hard time sticking to a smart “sensible eating” diet. I hope to reboot my eating habits by doing some absurd stuff for a few days, and then switching to the much more reasonable kind of diet I know works if I’m willing to be disciplined. This is, in a way, a starting gun. I’ve got to do something with all this Jell-O. Hey, I’ve got 42 packets of Jell-O here. They’re taking up fridge space. I weigh 186.4 pounds. Something must be done, before the season begins. Cumulative disgust with texture: I like Jell-O, but if there’s one thing that endurance cycling has taught me, it’s that one continuous texture for all your food gets pretty old, pretty fast. Oddly, this does not seem to hold true for breakfast cereal, which I could happily eat all day, every day. Cumulative disgust with sweetness: If there’s another thing that endurance cycling has taught me, it’s that I get sick of sweet food when that’s all I eat. Sadly, as far as I know, Jell-O does not yet come in nacho or burrito flavors. Alas. This stuff is expensive. These little Jell-O packets cost just under $0.50 each. If, as I ridiculously posited yesterday, I were to try to consume 1500 calories worth of Jell-O, I would have also consumed $75.00 worth of Jell-O. Also, I know for sure that the grocery store doesn’t have that much. Luckily for me, I can go back to the store and buy the much more reasonably-priced powder form. But honestly, I have a hard time imagining me eating more than the stock I’ve got. Outrageous hunger. I’ve gotten by on less than 500 calories in a day before. However, I’ve never gotten by on that when I’m also taking care of the kids and Susan. I can’t just slouch around and be grumpy today. I’ve got responsibilities, much as if I were an adult. So I’m giving myself a caveat: I can also eat bananas today. I know, I know: that kind of kills the drama of the event. I apologize. I intend to do several “Nothing But…” days in a row. 10:30am: 5 packs (3 red, 2 green), 1 banana. I feel fine, though I usually don’t eat a big breakfast anyway. 11:45am 5 packs (2 orange, 2 green, 1 red), 1 banana. This made only a minor dent in my hunger. I plan to have more in an hour or so. 1:15pm 3 packs (1 lime, 1 orange, 1 red), 1 banana. I’m incredibly disappointed in myself, because I seem to have already hit my gag threshold. See, I intended to eat 6 packs; I felt the gorge rising by the time I was into my second. In fact, I ate the third just to show it who’s boss. Is it really possible that my Jell-O Tolerance Threshold (J-OTT) is so low? Deliciously lime-flavored. A delightful treat any time of the day. And only ten calories. Thirty-nine of them, carefully stacked. That giant pyramid of food is only 390 calories. 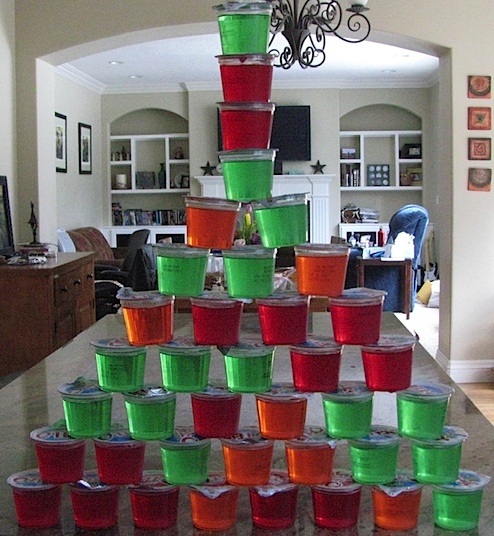 It makes you wonder: what if you had a day where you ate nothing but Sugar-Free Jello? Suppose you managed to eat 150 of them. You’d be full to the point of bursting all day. And you still wouldn’t have consumed more than 1500 calories. It’s just a thought. Silly conjecture and speculation. I would never consider actually doing this.